About inspiring, connecting, teaching, learning. We are creative. We push the boundaries. We each bring unique experiences and skills to every job at the Museum and together accomplish what we could not alone. We respect and support each other, knowing relationships among us matter. We embrace and share the spirit of the West. We strive for excellence in our work and celebrate our successes. We take time to hike, kayak, ski, knit and play ping-pong. We share our concerns and work through our issues together, focusing on what’s best for the Museum. We solve problems. We bring our dogs to work. We do yoga. We lunch together and laugh together. We celebrate our differences. We realize our workplace is a treasure. This is more than just a job. We Are The High Desert Museum. Current job opportunities as of April 2019. 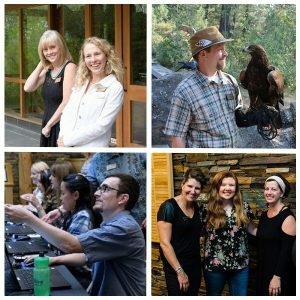 Internships at the High Desert Museum are based on educational objectives designated by the intern candidate, faculty advisor and the Museum’s internship supervisor, a manager or executive staff member who serves as the student’s mentor. Educational objectives should be clearly articulated in a project description that extends interns the benefit of work experience while supporting a directive within the Museum’s annual action plans. The educational objectives will form the criteria for evaluation and will describe the project itself, its scope and responsibilities, duration, arrangement for academic credit if applicable, and final evaluation procedure.